As the celebrations for the 30th anniversary of Erasmus came to an end on 30 November 2017, the European Commission published a report on the achievements of the Erasmus+ programme during 2016. The 2016 Erasmus+ report confirms the key role played by the programme in building a more resilient Europe united around common European values. With a 7.5% increase in the Erasmus+ budget compared to the previous year, the EU invested a record €2.27 billion to support 725,000 Europeans with mobility grants to study, train, teach, work or volunteer abroad. This brings the total to more than 2 million participants since 2014. In 2016, 21,000 projects received funding involving 79,000 education, training and youth organisations – 15% more projects than in 2015. The report demonstrates that Erasmus+ is well on track to meet its target of supporting 3.7% of young people in the EU between 2014 and 2020. It also shows that the programme has the potential to contribute to making mobility while learning a norm – a goal set out by the Commission in its Communication on “Strengthening European Identity through education and culture” discussed by the EU leaders at their Working Lunch in Gothenburg on 17 November. In the 2015/2016 academic year, Erasmus+ enabled higher education institutions to send and receive 330,000 students and staff, including 26,000 to and from partner countries. France, Germany and Spain were the top three countries in terms of sending students and staff, while Spain, Germany, and the United Kingdom were the three most popular destinations. In 2016, €200 million from the Erasmus+ programme supported 1,200 cooperation projects focused on promoting tolerance, non-discrimination and social inclusion. The youth sector, with projects targeting refugees, asylum seekers and migrants, was particularly active in this field. A specific call for proposals (€13 million) was launched for the development of policies and strategies to prevent violent radicalisation and foster the inclusion of disadvantaged learners, including people from migrant backgrounds. The call financed 35 projects involving 245 organisations. 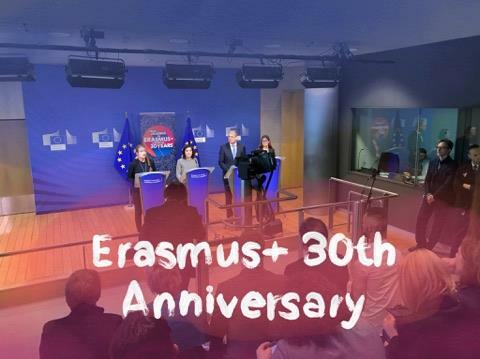 The publication of the report coincides with the closing of the campaign celebrating the 30th anniversary of the Erasmus programme and the presentation of the Erasmus+ Generation Declaration on the future of Erasmus+. Throughout 2017, more than 750,000 people took part in over 1,900 events in 44 countries to celebrate and discuss the future of Erasmus+. 65,000 articles on the programme were published and shared over two million times on social media, reaching over 90 million people. The new Erasmus+ Mobile App launched in June 2017 has already been downloaded more than 22,000 times. In Gothenburg, President Juncker invited the EU leaders to double the number of young people in the EU participating in Erasmus+ by 2025, which will require a budget of €29.4 billion for the period 2021-2027. During their meeting, the EU leaders agreed to step up mobility and exchanges, including through a substantially strengthened, inclusive and extended Erasmus+ programme for all categories of learners. The Commission also invited the Erasmus+ Generation to engage in the debate and created the Erasmus+ generation online meeting point. Their discussion resulted in 30 recommendations on how to make Erasmus+ a bigger programme with a bigger impact on the future of Europe. The Declaration drawn up by the Erasmus+ Generation was officially presented and debated during the closing event of the anniversary campaign.